where V – volume of the prism, S0 – area of basis., h – the length of prism height. 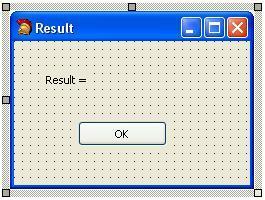 The result must be outputted as a separate window. To get the window of result we need create a new form. 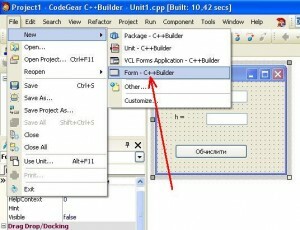 Create the new project as “VCL Form Application“. Save project in any folder. The name of module of main form leave as is – “Unit1.cpp“. The project name leave as “Project1.cbproj“. Developing the main form of application. At present, we have the main form of application named “Form1“. 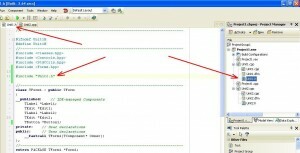 In Object Inspector you can change the form’s name with the help of property Name (Fig. 1). Leave all as is. – two components of type TEdit. We place components as shown in Figure 2. 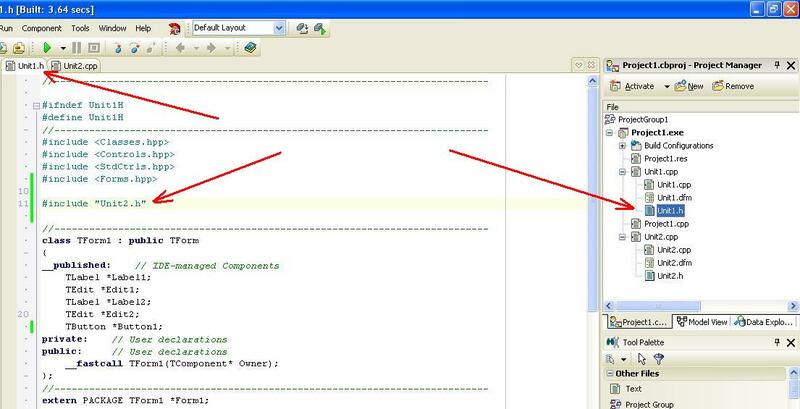 As a result the objects (variables) are created with such names: Label1, Label2, Edit1, Edit2, Button1. 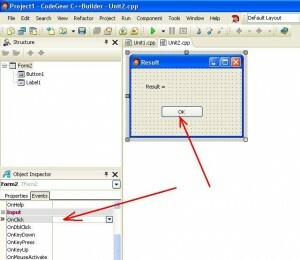 – in the component Button1 property Caption = “Calculate”. Also, you need to change the title of form. To do this you need to select the form (component Form1) and in the property Caption enter the text “Volume of prism”. After the changes and adjusting the size of components the application form has view as shown in Figure 3. In the new form you can output the result of calculation. The new form will be called after pressing on the button “Calculate”. As a result, the window of newly created form will be showed. The object (variable) named “Form2” corresponds to the new form (Fig. 5). will be proposed to save the file of module of form as “Unit2.cpp“. Let’s leave it as is. Moreover, the file “Unit2.dfm” will be created. In this file is described information about settings of form: form size, background color, text color, font settings and so on. Creating a new form Form2. – component of type TButton. As a result, two objects (variables) with names “Label1” and “Button1” will be created. Also, you need correct the size of form using mouse. As a result, the form Form2 will have view as shown in Figure 6. Let’s set up some properties of form Form2. To do this, first, we need to select form Form2. – property BorderStyle = “bsDialog”. After that, form will look like as a dialog window. – in component Button1 property Caption = “OK”. As a result, form will have view as shown in Figure 7. Programming an event of click on the button “OK” of form Form2. To get the result of returning from form Form2 and close the window of form, you need to call an event of click by mouse on the button “OK”. 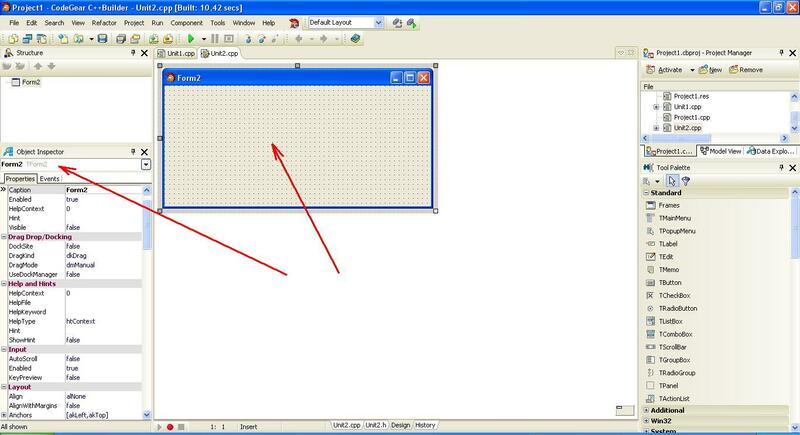 – make the double click by mouse in text field opposite the event OnClick. In the code snippet is used a global variable of form named as ModalResult. 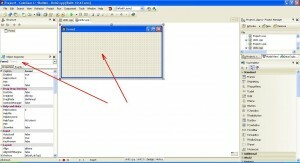 This variable is responsible for the behavior of the form window. By default the value of variable is zero. It means, that the window of form is closed. If value of variable ModalResult becomes nonzero, then the form is closing with the returning code of this value. In our case, in the variable ModalResult is set the value of global constant mrOk. It means, that the window of form “Form2” will be closed, with the returning code mrOk. The global constant ModalResult can taking and other values, for example mrAll, mrCancel, mrIgnore, mrNo, mrYes, mrRetry and so on. Setting the connection between forms. 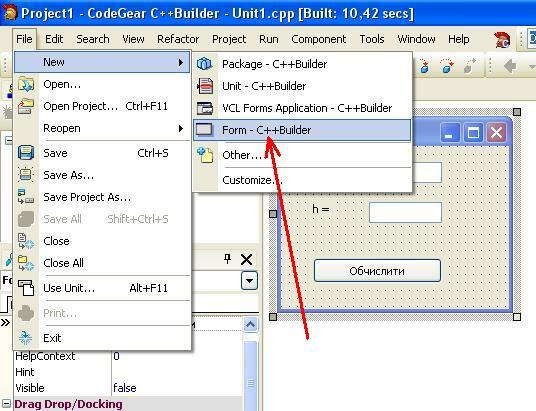 To call the form “Form2” from form “Form1” you need to connect the module “Unit2.cpp” in file “Unit1.cpp” with the module of main form Form1. 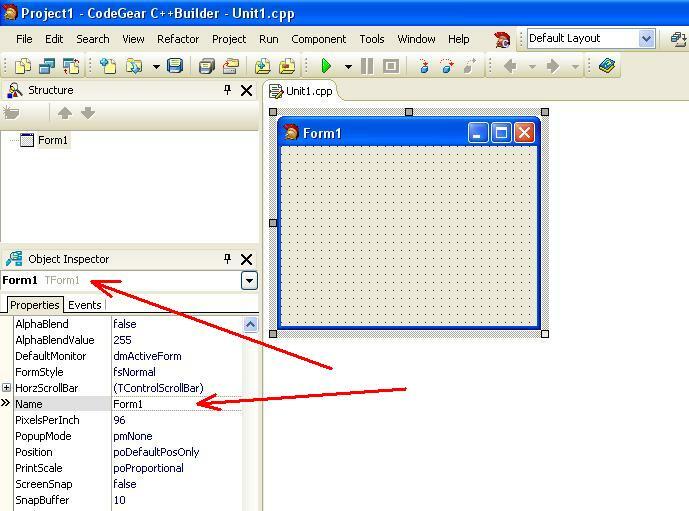 File “Unit2.cpp” corresponds to form Form2. To go to the code of module “Unit1.h” we need to do the double mouse click at the name “Unit1.h” in Project Manager (see Fig. 9). 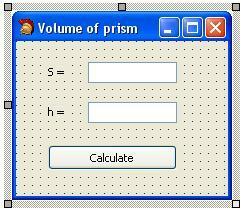 Programming of calculation of prism volume. To calculate the volume of prism you need to program the event of clicking on the button “Calculate” of form Form1. – type the text of calculation of volume of sphere. Listing of event handler of clicking on the button “Calculate” is following. In the code snippet to convert from string type to floating point type we use function StrToFloat. To convert back from floating type to string we use function FloatToStrF. This function gets input data of corresponding floating point value v, type of output format (ffFixed), the width of the output field (8 characters), precision of output result (2 decimal places). Now, you can run the project and test it. 004 – Delphi. A new form creating and connecting it to the main form of application. 006 – Example of creating a new form and calling the application in C#. 002 – An example of creation of dialog window in MS Visual Studio 2010 – C++ (MFC).